"The prophets never predicted the end would be like this." A cataclysmic event tears the fabric of reality apart. But the world doesn’t end in destruction as all the prophets predicted. Instead, it gets a whole lot stranger. In this bizarre landscape of mishmash realities, Eddie, Ruby, and a handful of their friends seek to understand what became of the Earth they once knew. They hear rumors of one who will seize the throne of God, a powerful being known as “Usurper”,“Godsbane”, the “Rat Messiah”. He’s reached for ultimate power once before, and if our heroes can’t stop him from trying again, the universe itself will burn. The Rat Messiah has not been reviewed yet. 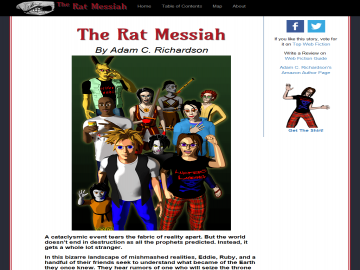 The Rat Messiah has not been recommended yet.